Having worked with hundreds of photographers (from all over the world) on their websites, I’ve recognized many ways in which the process can be improved. Let’s explore some tips and tricks to have a great working relationship with your web-designer. Small disclaimer: as founder of ForegroundWeb, I do offer affordable web-design & development services for photographers and would be happy to give you a free quote if you need any help on a project! But my goal with this detailed article is to help you run your project smoothly, regardless of what designer you’ll be working with. Too many photographers have told me about awful experiences they’ve had in the past, the web-design service industry is clearly flawed. This is my humble attempt to improve things a little, to help you better manage your work relationship with your designer or developer. Working with a great designer can totally super-charge your photography business. But they are usually hard to find (or are too busy) or sometimes they still end-up performing poorly on your project for some reason. It’s important to start with the right mindset: you’re not a web-designer. You should focus on the problems you want to solve, not the solutions. Let the designer/developer find the right solutions. That being said, you should consider the web-designer your business partner, instead of thinking of it as an employer-employee relationship. Realize that a good designer has a ton of insight to bring to the development of your business, to your marketing etc. So it’s critical that you show the designer that you’re the kind of client that respects them, that understands the value of their work. Don’t come into a project expecting to be presented with many concepts/designs so that you can then pick your favorites each time, based on your subjective preference. Once again, who is the design for? Your customers. So even if you do like the results, the goal is for them to be effective with your target audience. When you do have a clear plan in mind, and the website turns out exactly to your liking, you still can’t really expect overnight success. Your website design and the skills of your designer are only multipliers of the existing value you put out there. No magical design can save poor content over the long-haul. Great content multiplied by great design can do wonders, though! There are two sides to any (work) relationship, and you have to understand your part. To turn an interesting statement on its head: there’s no such thing as “designers from hell”, because only photographers from hell hire those types of designers. It’s your responsibility to choose the right kind of designer to work with. There’s no such thing as “designers from hell”, because only “photographers from hell” hire those types of designers. Most of the times when seeking to improve your photography website, you have a goal in mind and need professional help to get there. There are things (that will save you time and money) that you can prepare before you go to a designer: your clear goals, a detailed list of pages/features, your target audience, your business metrics and budget for the project, your competitors, the problems you’re having etc. Do you have your target audience as clearly defined as this? Getting this kind of clarity and knowing what to prepare for a new website are topics for a future article here. Open and honest communication is obviously critical throughout the project, but it’s essential in the beginning. Even if the project details have been defined to the tiniest detail, it never hurts to have a one-on-one quick phone or skype meeting with your designer, just to get a real feel of who you’re working with, and to clarify various final details for the project. Sometimes, communication skills are even more important than his/her skills as a designer, because that is a critical factor in turning your long-term plans into reality. With this in mind, pay attention to the designer’s promptitude (how often they email, what tone of voice their write in), and set this as a priority from the start. Collaboration is essential to building a great site, as no single person can think of everything or always have the best ideas for every aspect of a site. As a designer, the longest email I received from a photographer was 1.842 words in length (that’s about 7 pages long), with about 80% of it completely irrelevant to the project brief. As part of your communication skills, keeping your messages clear and concise saves time and avoids any confusion along the way. And when the tasks and small & many, I also recommend taking some time to gather a comprehensive list of all the changes you would like to see, and then send it to the designer at the end. Batching always helps productivity and usually cuts down significantly on email time and on time spent opening and closing files/software/connections to make minor changes. The progress of a task also relies on you replying to emails in a timely manner, so a time commitment needs to be taken by both sides of a project. If you just delegate tasks to your designer and then suddenly decide to go on vacation for a week, you can then really come back and expect good and timely results. Don’t forget to also respect your designer’s time zone, if working internationally. Unless there’s something really urgent, no one should have to answer work-related phone calls at 3AM. Regarding the choice of communication medium (phone vs email), it comes down to personal preference. I always prefer communicating by email, because it’s a passive interaction, it doesn’t interrupt any work in progress. Productivity is very important in my line of work, and phone calls, chats, and meetings are actual interruptions from work, which can be avoided in most cases. Obviously, if you have any urgent issue to discuss by phone, that becomes my top priority, but in most cases, email exchanges are more than enough. Ideally, you’ll be working with the designer on a per-project basis (versus an hourly rate), so you can both focus more on the quality of the work instead of rushing things. Payment obviously depends on who you’re working with: technicians perform tasks, focusing on their time and output only, so they can be considered a commodity and an expense. But true professionals focus on the results and provide solutions, so they’re actually a worthy investment for the value they provide. Make sure everything is transparent from the start, and that there won’t be any hidden costs along the way. Initial deposits sometimes have a bad reputation and clients get weary when paying them. A project deposit is a sign of trust, for both sides, and protects and commits both of you. The project is the fruit of your relationship with a professional design or developer. Polishing things should follow feedback from your target audience, not vague recommendations from your uncle or neighbor. So when you’re hiring a designer, you’re really hiring them for their professional opinions and experience. It’s normal to still get feedback from friends, but don’t let that overshadow your trust in your designer to come up with a good solution. Here’s a great article on the topic, nicely titled “Death to design by committee“. And when you do feel strong about some changes, it’s important to be open and honest about it, instead of starting to nitpick. The goal is to release a good version, test it, and then come back to improve it if necessary. When a work relationship goes south, you have to take part of the responsibility. 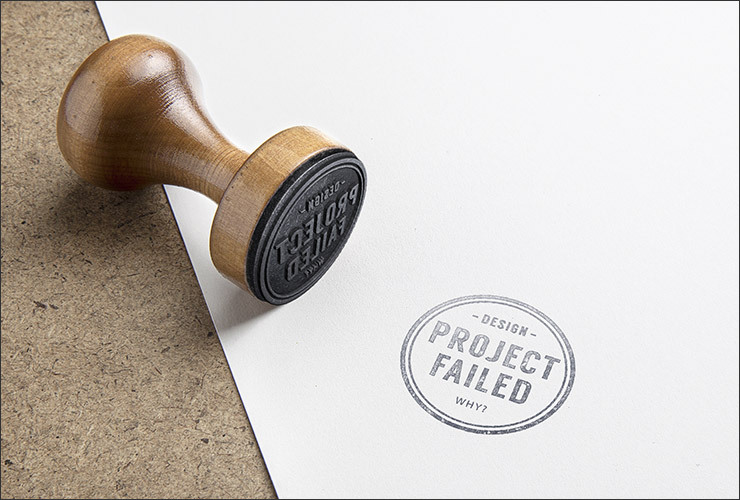 You might not enjoy hearing this, but when you’re just “licking your wounds” after a lost design investment, it was maybe a shortcoming on your part in terms of defining the project or setting the wrong expectations. Or just simply not spending enough time, in the beginning, to look for quality designers. You can’t simply blame the designer for every wrong action because even though you don’t have their design experience, you gave them the opportunity to fail. It’s hard to be comfortable with this idea, but it’s important. Try to use any bad situation as a learning opportunity, so you can avoid similar problems on your next project. You’re hiring the designer/developer for his professional experience, so it makes no sense to just give “orders” and ignore his/her recommendations. A photography website is not made for you to like, but for your target audience. And sometimes, your preferences conflict with what’s best for your business, your preferences might not always be the best. That’s when you really need to listen and try to understand the reasons behind any design decision and to be open-minded and willing to accept new opinions. Instead of just looking to add a shiny new coat of paint, a professional designer/developer should be interested in fixing the problems that are going to stop people in their tracks, to give you the honest professional opinions you need. It’s a good idea to think of it as a long-term relationship because you get to know each other, the designer gets to understand your target audience and your business goals. If you nurture a work relationship over time, you end up saving time & money, and the final products end up being better too. Your work won’t end after you launch your photography website, you’re going to be making stuff all the time (things like email newsletter, social media automation, new products, new software integration, new design elements etc.). So if you find a great designer to work with, protect and invest in that relationship, it can save you from a lot of hassle down the road. The main idea to grasp when working with a designer/developer is that the quality of your website/project depends more on how you work together than how skilled the designer is. You have to take part responsibility to how the results turn out. Hope these ideas will help you build a more honest and efficient work relationship with your designer.